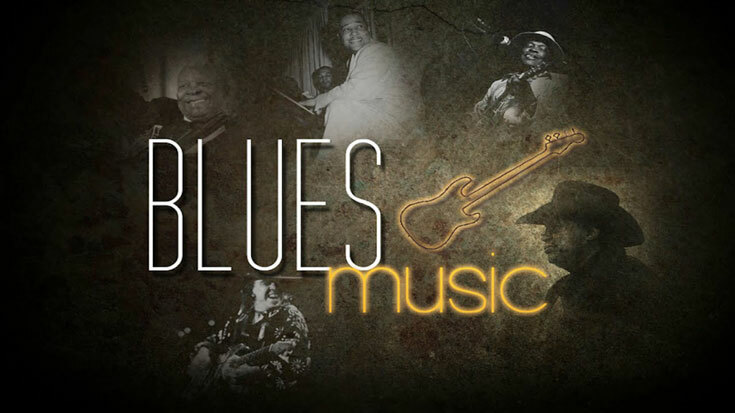 The blues music developed around the 1890’s in the Mississippi Delta area of the US. And the traditional blues image that we often see is a singer with an acoustic guitar and/or a harmonica. One of the typical examples for this genre is Robert Johnson, a famous bluesman. To the non-musicians, they often think that the blues is a musical style. To musicians, it is not only the musical style but also the musical sound and influence as well as the song form. Another interesting thing is that the blues style has shown a far-reaching effect on music. Some blues qualities such as particular slides, blues notes, and bends are heard both in singer’s voice and the blue acoustic guitar. With a deep, rich and soulful sound, it’s not only a killer solo from the guitarist but also a tight rhythm part working together. In a word, the blues music has an excellent groove. And you will never mistake this genre for the others for sure. What is the Rhythm Guitar? Instead of playing single note lines, rhythm guitarists have to learn how to play guitar chords. Although this part doesn’t sound as fun as playing the lead guitar, it’s crucial. The main objective of a rhythm guitarist is to maintain a solid groove. And if you miss this part, you cannot learn the lead guitar. The most common form of the rhythm guitar connects playing chords to a particular rhythmic figure that offers the groove. One of the simplest versions is to combine the acoustic guitar strumming chords while singing a song. So, playing the blue acoustic guitar means you are covering the whole rhythmic section. What is the Lead Guitar? A lead guitar player often plays the single note lines which go with what the rest of the band is doing. It might be guitar solos, awesome guitar riffs or even enthralling guitar licks. Let’s clarify this in your mind with a typical example of the roles of lead and rhythm instruments in a band, guys! Try to imagine that your preferred song is played by a guitar player, drummer, and bassist. If you don’t have a singer, how could your band play that song? Well, you may imagine the bass and drum playing a backup role in the music, making a bassline and beat. Meanwhile, the guitars play the lead section you often sing (it’s the melody). The lead guitarists also play solos (as I mentioned above), but what occurs if other instruments in the band might do the same thing. Or even, there is a singer to sing the song. At this time, the lead guitarist often won’t sit quietly until playing his solo. He might jump in on rhythm duties. And you easily catch this moment in a rock performance. Which is the Best Beginner Blues Guitar Book to Master Your Blues Skill? As a self-learner, the most important thing is to find the good book that can guide you on how to play the blues on acoustic guitar. Since you’re here, I will introduce the books that are extremely useful for newbies. As outlined above, you need to concentrate on playing rhythm guitar as starting learning the blues. And this book is one of the most excellent choices because it has an easy and logical order to follow as well as not clogging up pages with music theory. Aside from showing each element that contributes to playing grooving blue riffs, this book puts lots of musical examples in every chapter. And they seem to progress at a manageable pace. Of course, they are not too difficult to annoy and not too hard to cause frustration. The best way to learn this book is to go through every chapter with all the example within a week or more. Then continue the next chapter and repeat the previous one. Make sure to keep repeating the old ideas along with new stuff to improve your skill better. As long as you master each part, you soon write and adlib creative and exciting rhythm guitar parts. Note that The Complete Guide to Playing Blues Guitar has totally 4 volumes. So, whenever finishing the Book One, you can find the remaining ones to continue. But, as a beginner, you need to go with this book at first. 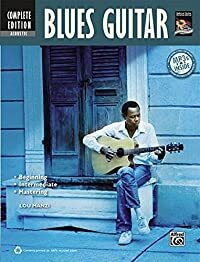 I recommend you should buy a combo of The Complete Guide and Blues You Can Use to learn the core elements of blue acoustic guitar thoroughly. This book introduces some basics blues you’ll ever play at the beginning. And in the long run, you can learn some simple rhythm and lead guitar phrasing to enrich and fit your own style of playing such as early rock & roll, R&B, blues/rock, Delta, gospel, etc. Additionally, the Blues You Can Use features blues riffs, chords, and progressions, chord-melody style, complete solos, turnarounds, and so on. What’s more, when buying this book, you receive audio and video access online. Although some reckon that this book lacks soul while playing, I think developing the “soul” needs to come from within every guitarist. Before you can place your real soul into your playing, you have to learn how to play guitar in the first place. That’s why this book will HELP you. 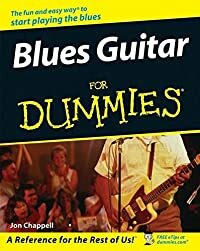 As its name suggests, Blues Guitar for Dummies is exactly the book of learning blues guitar for beginners. It includes all aspects of blues guitar lessons that guide you on how to play guitar chords, progressions, scales, solos, riffs, etc. Furthermore, it shows musical examples, charts, chords, and photos that allow you to explore this genre and play the guitar songs of the great blues musicians. Soon, you will master your skill in playing melodies and solos, playing barre chords, strumming to the rhythm, recognizing the structure of the blues songs, jamming to any kind of the blues music, and more. Wonderfully, this books also accompanies with a bonus CD. Relying on that, you can listen to popular songs, practice your chords and riffs, and improve your blues style. What’s more, it highlights a quick guide to musical notation and recommendations on guitars, artists, and albums for more enjoyment. Another exciting thing is that all three books above have their kindle version for those who don’t prefer the paperback version. So, depending on your desire, you can select any version you want. 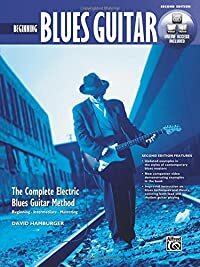 In case you want to become a blues-rock guitar player, the Beginning Blues Guitar by David Hamburger will be a great start. It introduces basic blues theory, rhythm styles of Texas swing, slow blues, left-hand techniques, minor blues, etc. Additionally, you can learn intros, turnarounds, endings, call-and-response phrasing, and improvisation. Similar to The Complete Guide to Playing Blues Guitar, this book has three volumes including Beginning, Intermediate, and Mastering. Since you’re a newbie, it’s best to buy the Beginning Book to understand the basics of the blues music firstly. The only thing that I don’t like is some of the video examples. Since they were played with the background music, I couldn’t hear the guitar only. But overall, this book is perfect for learning and improving your skill in playing the blues. 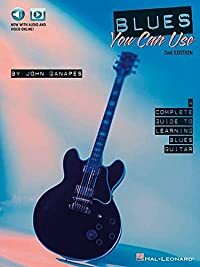 Here is the last book for learning blues guitar for beginners. 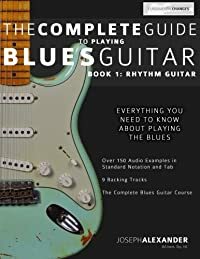 It introduces a comprehensive and well-paced method that can cover everything about the blues, from basic to advanced styles and techniques. That means you can discover all in one book. The beginning part consists of basic blues theory, left-hand technique, intros, turnarounds, etc. Meanwhile, the intermediate part includes a quick view at 16-bar, 12-bar, and 9-bar blues progressions before learning the scale-and-arpeggio-based blues soloing, opening tunings, and jazz blues. And the advanced part shows a thorough look at fingerstyle blues, pentatonic and blues scale theory and application, slide guitar technique, jazz blues, popping, and more. What I like most is all about examples for each part. They are fun and easy to follow and play. And all are in an MP3 CD that this book is included. You soon recognize that your progress has slowed or even stopped while you’re developing your skills as a blues guitar player. Don’t worry too much because this is normal when learning any instrument. To help you improve this, I would like to share some basic tips for learning blue acoustic guitar. Down here to know now! Remember that this rhythm often appears in the blues. As long as you practice it frequently, you easily get a better feeling of the blues, particularly the sound. Instead of practicing alone, it’s best to practice with a band or have a track recorded. Additionally, you should know that having a sense of rhythm is crucial while playing the lead guitar. In case you don’t have any rhythm, the sound you produce will be BAD. That’s why I suggest you should practice the metronome or to backing tracks every day. Relying on that, you can imbue rhythm with your playing. And whenever you pick up the guitar, you can play instantly. If your first desire in learning a solo is to search for a tab, you are cheating your most valuable gift as a musician. That’s your ears. Believe me; it’s annoying at first to smooth through a song by ear, but it becomes easier with experience. In case you mainly use the tabs, make sure to treat them as a second choice and just take them with a grain of salt. When recognizing your solos sound alike, you need to look at soloing from another perspective. Instead of seeing it as a collection of general patterns and licks, the best thing is to find out what tailors to a specific blue country song. Don’t jam on a one-size-fits-all shuffle! Try to choose a blue classic from Jimmy Reed or anyone and listen to the words. Then think about the message, learn the vocal melody and just make your own solo that shows all those elements. Although it sounds simple, it’s a MUST for every blues beginner. If you cannot play the 12-bar blues progression, it’s hard to get familiar with various blues rhythms. Always keep in mind that the rhythm guitar is the foundation of your playing. You cannot skip it and jump to the lead guitar, or you soon discover what you play is just a mess. Phrasing or improvising is the one. When improvising by using the pentatonic scale, you want your solo sound emotional, breathtaking, exciting, and cool. So, phrasing is often compared with speaking a language. Let’s explain clearly! In a language, you use words to make a sentence. And these sentences will tell you a story. How you use the words will define how compelling your story is. And when we speak, we often avail dynamics to emphasize and pauses to breathe. With improvising, it’s similar. You have to pause after some notes to let the music breathe. Besides, you have to avail dynamics to create the release as well as tension. And then there might be vibrato, hammer-on, pull-offs, and so on. When all are connected, they will create the story that you want to tell. Make sure you practice phrasing to make your blues music bright. In some guitar lessons for kids, children are guided to learn new stuff by reading tabs. However, transcribing helps them gain more. 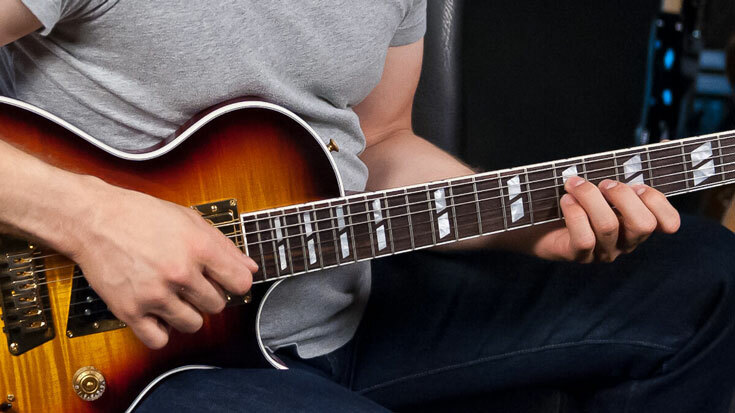 When transcribing easy guitar songs, you can learn how the guitarist uses phrasing. This doesn’t only develop your playing but also improve your listening to become a great musician. 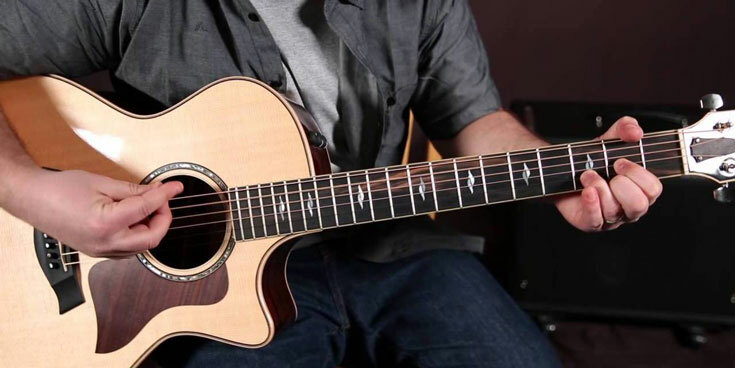 To learn how to play the blues on acoustic guitar, the first thing you should do is to know the basics. What are they? How do we start at the beginning? Etc. By choosing one of the best beginner blues guitar books, you’re guaranteed to understand everything about the blues music. As I mentioned above, it’s best to combine The Complete Guide to Playing Blues Guitar and the Blues You Can Use to comprehend this genre thoroughly. After all, the answer is yours. Select the book you want to master your skill and then start performing a perfect blues solo.